Yes, you'll require long strips of paper. I actually used wrapping paper, which worked really well. Origami paper isn't necessary for the curlicues, and I think most countries will have a range of nice wrapping paper to work with. So perhaps that's an option for you, too? Thanks i love your videos! So if you use wrapping paper, you just keep the proportions of 35 cm : 5 cm : 1 cm and enlarge it? or what would be the best measurement with the Single Strip Square Curlicue? Hi! On March 1 Mrs. Adams made a tutorial for the curlicue. Here's the link. I know I'm not the one you were asking,but any paper is fine,but you might have a bit of trouble with grainy paper. I am Rajesh here i am a huge fan of yours. You are very precise in you instructions. 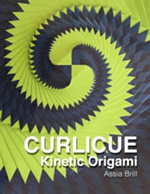 I would like to get the giveaway book on Curlice and I would be greaatful. Any idea what kind of paper is using in the book and on his youtube video? The paper almost has a nylon kind of look to it. Hi Sara, I'd like to buy this book Curlicue. Do you have any idea about where I can find it in New York City or Boston? i just wanted to make a request that can you scan the portion in which assia brill has shown the curlicue that you have shown in your youtube video. Please, make a Kindle version!